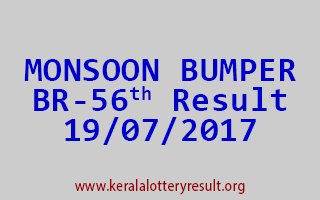 MONSOON BUMPER 2017 BR 56 Lottery Result 19/07/2017: Monsoon Bumper 2017 Lottery BR-56th Draw Result held on 19-7-2017 (Wednesday). Today’s Kerala lottery latest result published. Kerala lottery result July 19, 2017. Those who are waiting for the Monsoon Bumper 2017 BR-56th Kerala lottery result can now check the online lottery result here. The sale of Monsoon Bumper 2017 Lottery started two month before soon after the draw of Vishu Bumper 2017 on 24/05/2017. The result of Kerala Lottery " Monsoon Bumper-2017" is expected to be released by 3:30 PM. For Printing Official Monsoon Bumper 2017 Lottery BR 56 Result 19/07/2017 in PDF file: http://103.251.43.52/lottery/reports/draw/tmp55890.pdf.